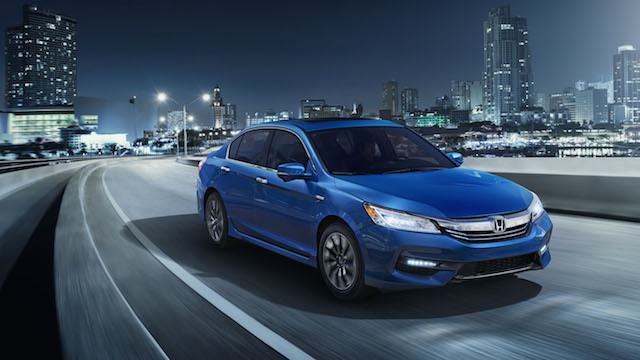 Among midsize sedans, the Accord Hybrid is the most efficient of all models. The Honda Accord Hybrid is back and is more efficient than ever. The 2017 Accord Hybrid is EPA-rated at 49 mpg in the city and 47 mpg on the highway for a combined 48 mpg. That’s 1 mpg better than the previous model, offered in 2014 and 2015 only. The all-new Accord Hybrid follows an important refresh of the standard Accord sedan and coupe for 2016. Gone is the earlier wraparound front bumper, replaced by a more pronounced front fascia featuring a larger intake area covered in mesh and augmented by standard LED fog lamps. Other exterior changes bring in a contoured aluminum hood, a sharply sculpted rear bumper fascia, and a new LED taillight design. Furthermore, a new rear deck spoiler debuts. And as for the Touring editions, side sill garnish, rain-sensing wipers as well as front and rear parking sensors are included. Blue accents across the front grille, surrounding the headlights and taillights signal that this is a hybrid, complementing the usual hybrid badging. All Accord Hybrids are outfitted with unique 17-inch aluminum alloy wheels. Eight patinas are available, including five which are new this year. Inside, the base model seats are swathed in a tricot seat fabric along with new wood grain-style dashboard trim. Three trim levels are available: Hybrid ($29,605), Hybrid EX-L ($32,905) and Hybrid Touring ($35,955). Honda expanded the hybrid’s standard equipment list, adding the Honda Sensing suite across the product line. The automaker describes Honda Sensing as a “suite of driver-assistive technologies can help you sense things you might miss while driving. In some cases, they can even help you avoid a collision or mitigate its severity.” Specifically, the package includes: lane departure warning, lane keeping assist, road departure mitigation, adaptive cruise control, forward collision warning, and collision mitigation braking system. As a result of the changes made on the safety front, Honda expects the Accord Hybrid will achieve a Top Safety Plus rating from the Insurance Institute for Highway Safety. The institute is funded by the major auto insurance companies, thus its findings can impact your insurance rates. Other newly available features for the 2017 Accord Hybrid include remote engine start, heated rear seats and auto high-beam headlights. Moreover, all EX-L and Touring models are equipped with a 7-inch color touchscreen display audio interface and are compatible with Apple CarPlay and Android Auto. A more compact battery pack enables Honda to increase trunk storage capacity to 13.5 cubic feet, up from the previous 12.7 cubic feet. The new number compares to the 15.8 cubic feet offered in gasoline-only Accord sedans. All Accord Hybrid models are powered by a 2.0-liter, four-cylinder gasoline engine operating in the efficient Atkinson cycle. Honda combines the engine making 181 horsepower and 232 foot-pounds of torque with a two-motor hybrid system. One electric motor starts the engine, the second one accelerates the sedan from a dead stop. Combined, the system makes 212 horsepower compared with the 196 horsepower of the 2015 Accord Hybrid. An electronic continuously variable transmission with sport mode rounds out this powertrain arrangement. Honda has changed its hybrid offerings in recent years, discontinuing an earlier plug-in Accord Hybrid as well as the Insight and Civic Hybrid. In addition, the automaker offers the hybrid-only CR-Z, a sporty two-door hatchback model. This automaker is also expanding its Clarity line, currently composed of a fuel-cell sedan. The newest version of the hydrogen-powered model returns later this year and will be followed by two other models in 2017 — an electric vehicle and a plug-in hybrid. However, not all models will be available in every market. Photo copyright American Honda Motor Co., Inc.